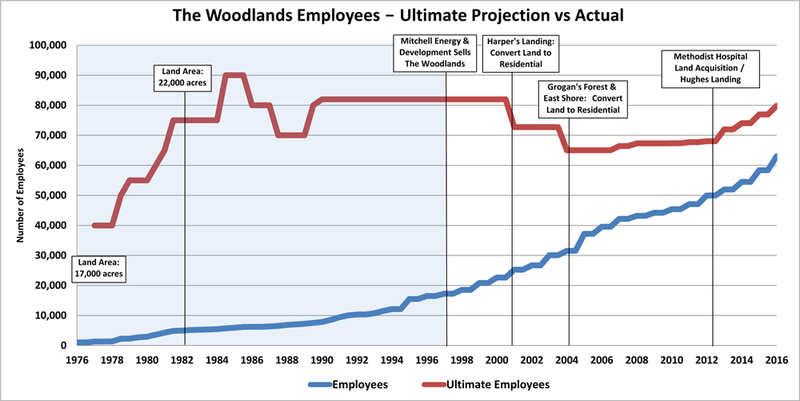 Population and Employment Projections for The Woodlands- Have They Changed Over the Years? The economics of land development dictates, with rare exceptions, “rooftops first” followed by commercial development and employment. Therefore, the residential villages developed first in a counter-clockwise fashion around the future Town Center, in order to provide the supporting population and facilities needed to develop a true downtown. Conventional wisdom at the time would have located the first supermarket-anchored village center on the most accessible land at the northwest corner of I-45 and Woodlands Parkway. Fortunately, this land was not developed initially, but reserved for the future Town Center. This is the current location of Anadarko. The Woodlands has expanded in acreage significantly over the years. In 1972, the land area comprised approximately 17,000 acres. By 1981, it had grown to over 22,000 acres. It currently consists of over 28,471 acres, an increase of over 67% compared to the original land area. From 1972 to present, population projections “at completion” have actually decreased, in spite of the increase in land area. The 1972 Environmental Impact Statement (EIS) projected 49,000 dwelling units and 156,000 residents on 17,000 acres. The Supplemental Environmental Impact Statement (SEIS) in 1981 projected 60,000 dwelling units and 150,000 residents on what had grown to over 22,000 acres of land. Every year since 1976, The Woodlands Development Company has compiled a “Community Facts” sheet containing, among other things, current and projected ultimate population and employment. This information was available at the Information Center or Homefinder Center. The 2016 Community Facts sheet projects a population of 130,800 at completion. This represents a decrease of approximately 13% when compared to earlier estimates from the 1980’s through the year 2000, which projected an ultimate population of 150,000. The reduction in population has resulted primarily from a reduction in residential density in spite of the land area having increased in size by 6000 acres over the same time period. The Woodlands has always been envisioned as a major employment center. The Project Agreement Between the United States of America and The Woodlands Development Corporation of 1972 describes a future mixed use regional Metro Center (or Town Center) comprised of retail, office, entertainment, and hotel uses. Urban residential development has been added over the years as a significant component needed to create a successful mixed use urban center. The 1981 SEIS projected 69,525 jobs within what was then a 22,000 acre project. When Mitchell Energy and Development sold The Woodlands in 1997, 82,000 employees were projected “at buildout” on 26,612 acres of land. The current 2016 projection calls for 79,820 employees at completion, a reduction of 2000 from the time of the sale in 1997. The reduction in projected employment from 1997 to 2016 has resulted primarily from a change in land use (from commercial to residential) in Harper’s Landing, Grogan’s Forest, and East Shore in Town Center. In the early years, the jobs/household ratio was quite high because of the early development of The Woodlands Conference Center, the relocation of The Woodlands Development Company offices from downtown Houston to The Woodlands, the opening of Jamail’s supermarket in the Grogan’s Mill Village Center, and the opening of McCullough High School. After the initial spike in jobs, a 14 year downward trend in jobs/ household ensued from 1979 to 1993. In 1993, after 20 years of development, there were only 13,500 jobs in The Woodlands, a fraction of what was projected for that time period. The opening of the Woodlands Mall in 1994 sparked the beginning of a turnaround in job growth. During the next 13 years, The Woodlands experienced its greatest increase in job growth and actual number of jobs. From 1993 to 2006, over 30,000 jobs were created, resulting in a total of 42,190 jobs by 2006. These jobs were created from the opening of Montgomery College, The University Center, new schools including The Woodlands High School and College Park High School, Aon Hewitt, Anadarko, the Marriott Hotel & Convention Center, St. Luke’s Hospital, Market Street, the expansion of The Woodlands Mall, and many other businesses. From 2006 to the end of 2015, employment continued to increase at a slightly slower pace by over 20,000 jobs for a total of 63,030 jobs at the end of 2015. These jobs resulted from development at Waterway Square, the Anadarko Headquarters expansion, and the addition of Hughes Landing. With 41,849 households at the end of 2015, there are currently 1.51 jobs/household in The Woodlands. At “buildout,” households are estimated at 51,105 and jobs are estimated at 79,820, resulting in a ratio of 1.56 jobs/household. Click here to view a graph of the jobs/household ratio from 1974 to present day. Actual development pace has lagged behind initial projections. The 1972 EIS projected completion of development in 20 years by 1992 with a population of 156,000 residents. The 1982 SEIS revised the earlier estimates and projected development to be completed with 150,000 residents and over 69,000 jobs by 2010. Commercial development typically follows residential development. In the Town Center it has evolved slowly as the supporting population and amenities have developed. The dates of key events are listed below including the number of years after the official opening of The Woodlands in 1974. Even though The Woodlands land area has increased by 67% from its inception to its current size, the current projected population and employment at full development has actually decreased due to a lower density of development and preservation of open space. The goal to develop a minimum of 1.5 jobs/ household has been realized. According to a recent survey, approximately 45% of employed residents who live in The Woodlands also work in The Woodlands. The pace of development in The Woodlands has been much slower than originally anticipated. While the land area has increased by 67% over the years, the original development period of 20 years has increased to at least 46 years and completion of all land programmed for development is now anticipated to occur after 2020. Of course a community is never really “complete.” The Woodlands will continue to evolve and change over time, but to date the vision of The Woodlands continues to be realized.